These stylish Poker Chip Sets are crafted from the highest quality materials. 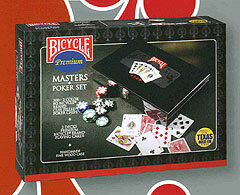 You can choose from a range of styles including the Bicycle Poker Set with its handsome black lacquer box, and "The Cadillac of Poker Chip Sets," which comes fully equipped with for play with Casino Pro Clay Chips, Compass Back 100% Plastic Playing Cards, and Four Poker Buttons. 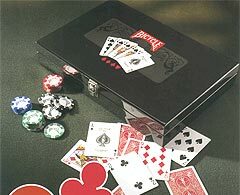 Designed for the discriminating poker player, this 600-Chip Set features the highest quality craftsmanship. The mahogany varnished case has an eight-row removable top tray, four additional rows under the tray, and storage space for your cards, buttons, and money. The case also features matching brass carry handles, hardware, lock, and key, and the bottom exterior of the case is covered with black felt to protect your playing surface. Each set also features two poker size decks, one red/one blue, of our 100% Plastic Copag Playing Cards. These are the same quality as cards now being used in professional card rooms across the country. "Dealer", "Little Blind", "Big Blind", and "Missed Blind" Buttons are also included. With its unparalleled quality and style, this set is perfect for serious, high stakes players. 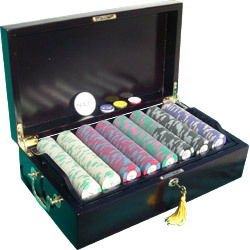 This 600-Chip Set features the highest quality craftsmanship and is perfect for serious poker players. The case features a Mahogany-color varnish, and it has an eight-row removable top tray, four additional rows under the tray, and storage space for your cards, buttons, and money. The case also features matching brass carry handles, hardware, lock, and key and the bottom exterior of the case is covered with black felt to protect your playing surface. Additionally, each set features two poker size decks, one red/one blue, of 100% Plastic KEM Poker Playing Cards, the gold standard in plastic playing cards. "Dealer", "Little Blind", "Big Blind", and "Missed Blind" Buttons are also included. With its unparalleled quality and style, this set is perfect for serious, high stakes players. On Sale: $49.32. Was $89.00. Save 45%! Great Value - You save 30% off the regular retail price for individual set components! *The 300 chip set contains 100 white, 100 red, 50 green, and 50 black chips. 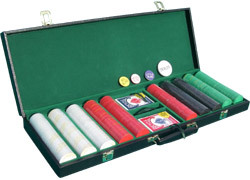 The 500 set contains 150 white, 150 red, 100 green, and 100 black chips. These Imported Wooden Chip Carousels are handsome and sturdy. 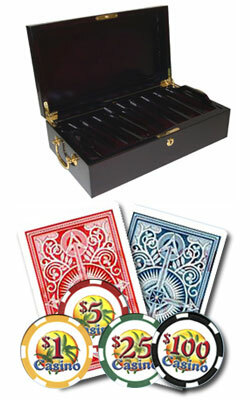 They feature hard wood construction, brass finish carry handles, and slots for two decks of cards. 200 and 300 chip capacity carousels are available with White, Red, Green, and Black 8.5 Gram Diamond Chips. Now $39.50. Was $59.50. Save 34%! Now $49.50. Was $89.50. Save 34%! 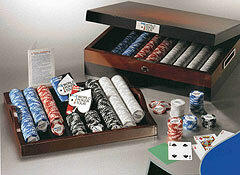 Feel free to browse our wide selection of Poker Chip Cases, Poker Chips, and other Poker Supplies. Or, contact us to get a Free Copy of our 104 Page Casino / Game Room Supplies Catalog.